"I recommend him to all my clients and fellow athletes." "Dr. Payne's approach focused on not just short term relief, but long term health..."
"BEST chirpoctor in town! Would definitely recommend ProForm to everyone!" "Dr. Payne was able to fix my hip years ago and it still feels great!" "This place is amazing. Staff is very knowledgeable and professional." "The staff is very friendly and you feel like you know them as soon as you walk in." "Always put my trust in his ability to get me up and going again." "...I would highly recommend his services." "Made a huge improvement with my neck as well as my wrist in a few sessions." "This was my first time to see a chiropractor, and this place is fantastic!!" "Awesome place, they really care about their clients." Pain is not a lifestyle, and you do not have to wake up or go to bed in pain. 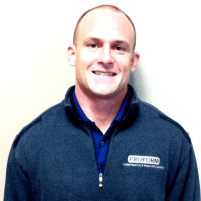 At ProForm Clinics in Flower Mound, Texas, Gordon Payne, DC, provides chiropractic and wellness treatments to improve your health and eliminate your pain. Dr. Payne provides patients with chiropractic adjustments, massage therapy, foot pain relief, headache treatments, weight loss plans, and more. As a board certified doctor in chiropractic and physiotherapy, Dr. Payne is a trusted expert in diagnosing and treating any of your musculoskeletal conditions. He is the go-to chiropractor for healthcare professionals across the region. Dr. Payne is known as a leader in the industry by giving his time to teach corrective recovery and advanced healthcare techniques to providers around the globe. When you first meet with Dr. Payne, you will go through an initial consult where he will get to know you as an individual as he goes through your health history. Spending time gathering as much information as possible enables Dr. Payne to customize a treatment plan so you can live injury-free and achieve the best health of your life while continuing to participate in activities you love at the highest level possible. While many men and women come into ProForm Clinics after having an accident, you don’t need to have an injury to visit with Dr. Payne. People seek chiropractic treatment to improve energy levels and maintain feeling their best. Dr. Payne will treat any pain or injury you have, he will then continue to work with you to improve your overall wellness. Because ProForm Clinics is a one-stop-shop for all of your wellness needs, you’ll find that Dr. Payne and his team will continue to be your go-to providers for many of your health and wellness concerns. ProForm Clinics in Flower Mound, Texas, is conveniently located for people living in the neighboring towns of Highland Village, Lewisville, Bartonville, Argyle, Denton, Corinth, Copper Canyon, and more. To actively resolve conditions that keep people from participating in life at their fullest potential. Healthcare is undergoing a major transition. Did you realize that for the first time in history our children are not forecasted to live past the age of their parents? Did you realize that, according to the American Medical Association, the third most likely thing you will die of as an American is now a medication that was PROPERLY prescribed? Unfortunately, these questions are only the tip of the iceberg, but they are also the reason why we are extremely unique. We offer people all-natural, noninvasive, and completely customized healthcare solutions that focus on an inside-to-outside philosophy based on facts. Whether that is the latest in imaging techniques or extensive blood work, we want to know what your body needs. We see patients ranging from all ages (even newborns) and with a variety of conditions. If you are experiencing pain, weight gain, headaches, body aches, fatigue or any symptom that you want to fix, then let's take the first step together and talk about your wants and needs during a one-on-one consult. DID YOU KNOW THAT ALMOST 90% OF MUSCULOSKELETAL INJURIES DO NOT REQUIRE SURGERY? The Proform Clinic experience starts with you and your specific injury. We perform a diagnosis designed to test the functionality in your body's key movement areas. After this diagnosis is complete, the Proform doctors will identify your injury. Once your injury is isolated, we target it with a combination of soft tissue treatments and physical therapy custom tailored to you and your body. We pride ourselves on getting you back in the game as fast as possible. A Chiropractic adjustment is a procedure in which our doctors use their hands or a small instrument to apply controlled, targeted pressure on a particular spinal joint. The goal of a chiropractic adjustment, also known as spinal manipulation, is to correct structural alignment and improve your body's physical function. Regular adjustments can improve nervous system function, relieve pain and discomfort, and can increase vitality and overall health and wellness. The doctors at Proform Clinics utilize the most advanced techniques available for Chiropractors. We use our hands to stretch tight fascial structures or relax dysfunctional hypertonic muscles. We apply direct force to tight muscles, stretching and kneading them until relaxation occurs. In addition to solving the injury, soft tissue treatments can increase the amount of blood circulation to muscles and fascia, leading to more rapid healing rates. Each body is different. Every injury manifests in different ways. After the detailed assessment and diagnosis, our doctors custom tailor a therapy regimen. You will spend time in our office, with the doctor, going over every aspect of the prescribed therapy. Our therapy programs are sequential, designed to increase in difficulty each time you come in. Our goal is for you to leave each visit with a solid understanding of your injury and what you can do at home to help improve your performance. Our athlete performance package is designed for healthy patients looking to get that extra edge out of their training. We utilize a combination of soft tissue and physical therapy to push your body to perform at it's highest potential. We have a custom programs for athletes looking to run faster, throw farther, jump higher, lift more, and swing with more power. This program is ideal baseball players, soccer players, football players, basketball players, volleyball players, tennis players, softball players, golfers, cyclists, runners, and body builders. Over 90% of people already know the benefits chiropractic care can have on their performance. For athletes that know they need weekly or monthly care, we will custom develop a program that allows you to take advantage of the full suite of services offered by Proform Clinics on a regular basis. Signing up for this program will also save you money. Services are automatically billed each period and you can schedule appointments same day in order to fit perfectly in to your training program. We can get you in and out for adjustments quickly. This is by far the best value for the services we offer. The Dallas/Fort-Worth area is home to some of largest fortune 500 businesses. A significant portion of those executives live in Flower Mound and are patients at Proform Clinics. Our Executive Stress Reduction package targets the key areas where stress is frequently carried, the lower back, the neck, hamstring and shoulders. With a combination of soft tissue work and physical therapy, we can work out kinks and reduce headaches. Our patients frequently tell us they are less stressed and more productive after these sessions. All of the doctors at Proform are trained in the latest taping techniques. We use Rock Tape™ to help athletes treat injuries and improve performance. When taped the right way, Rock Tape can be used to help with Achilles tendonitis, Plantar fasciitis, Jumpers knee (PFS), ACL/MCL issues, Rotator cuff, Groin and hamstring pulls, Lower back issues, Shin splints, Tennis and golf elbow, pain associated with pregnancy, and postural correction. Taping is free with your visit. If you've experienced aches or injury from a car accident ProForm Clinics offers treatments tailored to calm your ailments. At ProForm Clinics we accept cash, and are now offering Care Credit. Your health is our number one concern. We work with all insurance plans, including but not limited to BCBS, United Healthcare, and Aetna. In today’s market, each plan is different. Regardless of whether we’re in network or out-of-network with your plan, our team aims to get you the best coverage and treatment based on your needs. ProForm Clinics also partners with all auto accident insurances. We strive to have highly-affordable rates and flexible payment plans allowing access to high-quality care for you and your family. "I have been a patient of Dr. Payne’s on the chiropractic side and on the wellness side. I am currently following a plan designed by him to transform my lifestyle..."
"Dr. Gordon Payne and staff are some of the best, most caring, and informative professionals I've met." "Dr. Payne is easy to talk to and really knows his craft. I've seen him for routine care and specifically for my shoulder and my hip. He's helped me correct with both." "I started seeing Dr. Payne about 4 years ago and mainly saw him as my "rescue" chiropractor meaning I only ever saw him when I was in pain." "ProForm Clinics is a life saver! I used to wake up daily with headaches... I'm only 1/3 of the way through my treatment plan and the headaches are gone!" "They come up with a plan to fix it, and have many different treatment methods. Only place I'll ever go." "I wouldn't spend another dime on another chiropractor. He is much different then your typical chiropractor. Obviously I would highly recommend this place to anyone!" "Dr. Payne has gotten me back in the game after injury. He also helps me through the good times. There is not a better chiropractor in the Metroplex." "i was highly impressed with the advanced version of physical thereapy Gordon has planned out to get me back into my exercises asap." "Dr. Payne is so personable and easy to talk to. He listens to what the problem is, even though he is usually able to identify my problem area before I even say it." "Before Proform I had seen numerous doctors with little to no success. Dr. Payne is very patient and takes the time to listen to you." "I cannot say enough about Dr. Payne and his staff! Just the very BEST!!" "Going to ProForm has been life changing!!! " "Dr Payne is my go to solution to ensure my body is competition ready. "